The standard program /ARBA/MASTER_DATA_EXPORT needs to be customized or you will keep wasting your time to find the implicit enhancement points which are too less and not at the right places. So I just did what was the easier thing to do copied the entire program as a Z and then did the changes.When you run the program you see radio buttons like Procure to Order and Procure to Pay, Sourcing and contracts. Integration Toolkit: This loads the file in a shared drive and Integration layer (PI/PO) should pick this up to send to Ariba. It may require you to change some column name to make it as a the primary key for example instead of the user Id which is the default primary key for the user extraction client wanted to make email ID as the primary key. So, I had to change the name of the column for email as UNIQUENAME (Ariba understand UniqueName column as the primary key) for the user extraction file and assign it as value of email. In /ARBA/FIELD_MAP the field BNAME (User ID) currently is mapped to Ariba field UNIQUENAME. I now want the email ID field to populate for UniqueName. Lets have a look at how this was done. 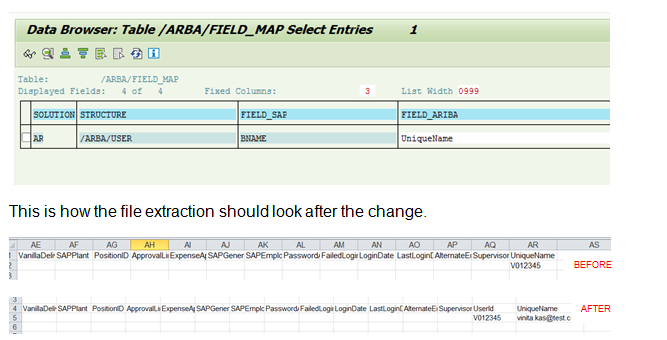 In Table /ARBA/FIELD_MAP in SM30 I added an extra SAP column UNIQUENAME1 in SAP. Then name of the column on CSV would be UniqueName This value UNIQUENAME1 was assigned the email ID. Also I changed the label for BNAME to UserId as only 1 field can have value as UniqueName which becomes the key in Ariba . Method /ARBA/IF_EXP_MASTER_DATA~MODIFY_USER_DATA is called for each time the user record is extracted so I enter my field UNIQUENAME1 and pass Email address. Remember this is a structure so it will be called for all entries one by one. 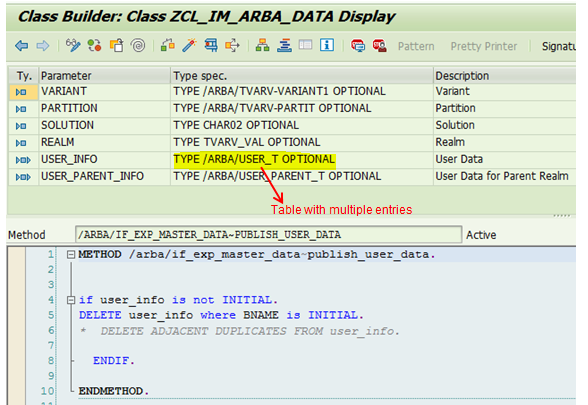 However most of the methods like /ARBA/IF_EXP_MASTER_DATA~PUBLISH_USER_DATA have exporting /changing parameter as table. So you can loop at each record and delete if the Email ID is blank etc as this is our primary key so keeping it blank will create issues in Ariba. Now when you have the file extracted as a CSV it will have an additional column as UniqueName with the email ID of the user when the Ariba program would be run. Note that not all data can be set up as incremental load. 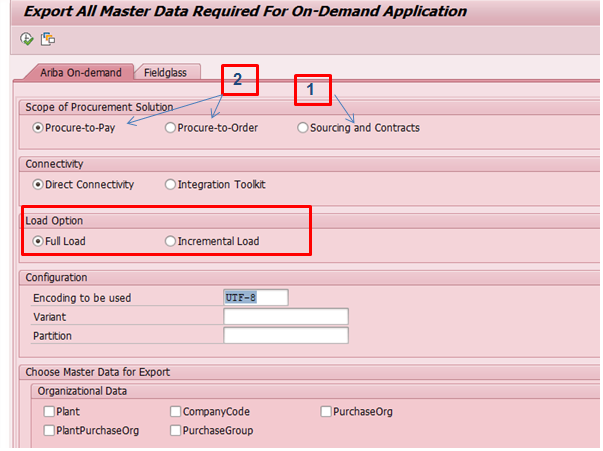 In P2O/P2P scenario the incremental load consists of below master data. If the data which you wish the send to Ariba is not included in the incremental list above like product category, Pur grp, company code, pur org etc. then you need to either update that manually or send an initial load everytime as needed. How would the system know what changes occured since last time and how to pick the delta load? he program handles the incremental load based on a table /ARBA/INCR_DTTIM. Everytime an incremental load is run the table gets updated with date and time of the specific load which was run. THe next time system would automatically filter the data based on the last updated fill from the table for users, suppliers or other master data for which you plan to run the incremental load. After the load run the system automatically update the Date information and the next time for incremental load it references this to understand what has been the delta change in the system since the last run. Data fails in Integration like email IDs have special character this needs to be handled by custom logic by creating email aliases etc. If number of error records are more than say 100 or something the entire file fails to load in Ariba. The data send needs to be corrected before you send the file again as it stops reading the entire file after a threshold of N number of failures is reached. If the jobs are Run for incremental load ensure that the datetime stamp gets correctly updated by the system in the table /ARBA/INCR_DTTIM. This is how the system knows which records to pick up for delta extraction. When you put filters for the load like user you may use below files. For incremental load for users SAP does not provide any method in the BADI to modify the incremental load files for deletion like userdelete and usergroupdelete files. These files User Deleted File and UserGroup deleted file are sent to Ariba to deactivate those users who have left the organisation. However no method in the BADI is triggered for formatting these files Hence I came up with a workaround as below. Overwrite the extracted user deletion and group_deletion file with the required data. Rename the file using below code where gv_fname is the file which was generated without the filter. So I am Overwriting the same extracted file with additional information that I need to pass to the Ariba system. In my master data program I modify the gr_user_del file to add email and also rename the file to the same name as was used by Ariba so my file replaces the original file created by the program. MODIFY   gt_user_del FROM ls_user_del INDEX lv_index. CONCATENATE gv_fname 'GroupConsolidated_Delete.csv' INTO lv_file_name. Create Documents like contract, PO to ensure the system data for the users is correctly updated and you are able to create the documents successfully with multiple users. If there are failures in loading the data to Ariba verify that file format being sent to Ariba is being read correctly. Check the system is reading the incremental load correctly with a small set of data for suppliers and users. If there are issues check incremental files have the right format and changes which you applied to the initial file load whether they are needed or not for the incremental push. Check integration of the system is correct from and to ECC and SRM as applicable. Ensure there is a process documented for all manual activities like updating delta load manually if not set as a batch job e.g. for new product categories, cost center and WBS. There are email notifications being sent from Ariba ensure that SSO is enabled for them and they are being sent to the right recipients. Thanks for reading. I hope this document is helpful for those looking to find some help on using the master data extraction program. Excellent blog !! The “lesson learnt” and “test case” section are the best….Thanks for sharing… !! Is SQL and ABAP knowledge compulary to do the extraction…. You just need to configure the ERP and Standard program will run and that contain the ABAP code, by which you can send the data. Hi Vinitha, thanks for the information. I am also doing master data integration and run the master data export program. I select the sourcing, company code, full load and execute the program. You need to maintain a temp path in ARBA/TVARV. Make sure that this path is valid. Thanks Kristoffer for the suggestion but i had given the correct path as .\Masterdata in selection value at Temp_directory in ARBA/TVARV. From where we can find the Valid path in SAP for tem_directory. Can you please advise on this path issue. I m also facing similar issue. Set Logical file path in SAP. I am facing the same issue, so I just wanted to know that is your issue is resolve. If your issue is resolve can you help me to complete this process. Actually i read integration blog by prapti Vyas and one another blog , and i found completely opposite info in both blog . According to Prapti Vyas blog , ITK method we used when we dont have PI as middleware but according to another blog i read ITK we used when we used ITK when we have PI in between . Can you please clarify ? ITK can be used when we are using PI or any other middleware also, but that is not mandatory. We can use ITK independently to integrate whether we are not having PI/PO. Can we use for Direct Connectivity ? To be honest , Can you please explain briefly or provide me some document for integration or ITK ? Yes, defiantly we can use it in direct connectivity. Provide me your scope of work, As standard to start ITK, first download ITK from connect.ariba.com and download SAP ITK guide. ITK basically a file transfer integration which extract the data from source(ERP) and through to destination like Ariba sourcing. Thank you for Clear test cases and documentation. I have below query, could you please clarify the same ? We have only Ariba contract management, SAP S4 HANA and PI/PO as a middleware system. Can we customize this report and load supplier master data automatically ? 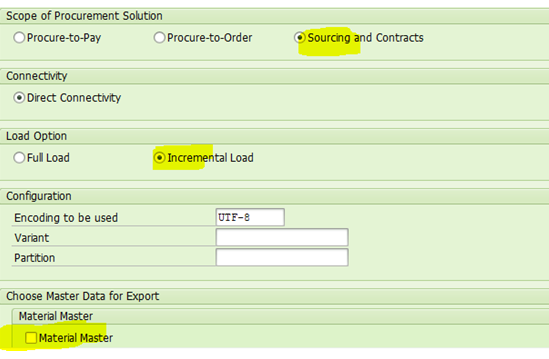 I sent all Master data from sourcing and contract part, but Now I want to send the supplier data to the Ariba and its comes in Procure to Pay. Vinita Kasliwal – Thanks for blog nice from integration prospective further if you can also share some details if any customer wanted to have some custom filed added in Ariba P2P or P2P example if Storage location from ECC wanted to have in PR , what all considerations we need to consider and how master data to transactional interface will work. Thanks for the blog, have successfully added to the SupplierLocation.csv and thought it would be a similar process for the UserConsolidated.csv, part of my requirement is to overwrite the information in columns DefaultCurrency, SAPPurchaseGroup, SAPPurchaseOrg. These are not part of the structure within MODIFY/PUBLISH_USER_DATA. Would really appreciate a tip on how these columns can be populated with data? I have a requirement to extract Ariba data into SAP BW for reporting purposes. Do you have any ideas on how this can be accomplished? I have not been able to find info on standard extractors. I am Devesh Agarwal , working in infosys and i am learning ARIBA so i just need some knowledge . 1.ECC/S4—>ARIBA ( No PI involved and no ITK involved) : The connection is setup in S4/ECC -SOLMAN to send directly to Ariba. 2.ECC/S4–>PI(Via PROXY to SOAP)—>ARIBA : No ITK involved, standard content is used to setup Proxy to SOAP interface. 3.ECC/S4–>PI(ITK)—>ARIBA: ITK is isntalled in PI to upload/download data. 4.ECC/S4–>Any Windows or Unix Server–>ITK : Standalone ITK batch jobs are scheduled to transfer data. Has anyone customized Master data program to update Cost Centers for Upstream ? Currently cost center and GL account updates are only available for P2P not for sourcing & contract. Please provide solution or approach that was used in your case.